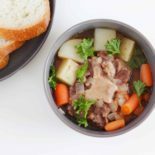 This Simple Slow Cooker Oxtail Soup is Hearty and Tender! This oxtail soup recipe is rich, hearty, and easy to make in your slow cooker! 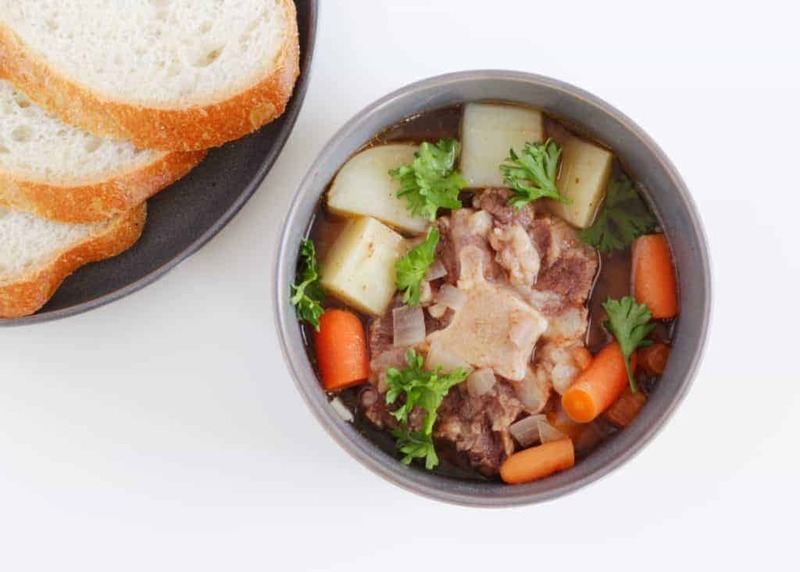 With tender fall-off-the-bone meat and a healthy bone broth with flavorful vegetables, this crockpot oxtail soup is sure to become a cold-weather favorite in your family! If you have never heard of oxtail soup, you are not alone! I had never heard of oxtail soup until I met my husband. It was apparently a common food for his Chinese family growing up. We Americans don’t seem to be as used to eating meats that have cartilage…or bones…or heads. (Case in point, the movie A Christmas Story; my husband always cracks up at the scene in the Chinese restaurant). But I am about to change all that! If you love beef stew, there is no reason you won’t also love this soup. It’s hearty and full of protein. It also contains lots of calcium, B vitamins, and iron…my husband reminds me every time we eat it that this soup is ideal for healthy bones and joints. The consistency is somewhere between a soup and a stew; not too thin, not too thick. Best of all, it’s super simple to make with the most hands-off method possible: in a slow cooker. 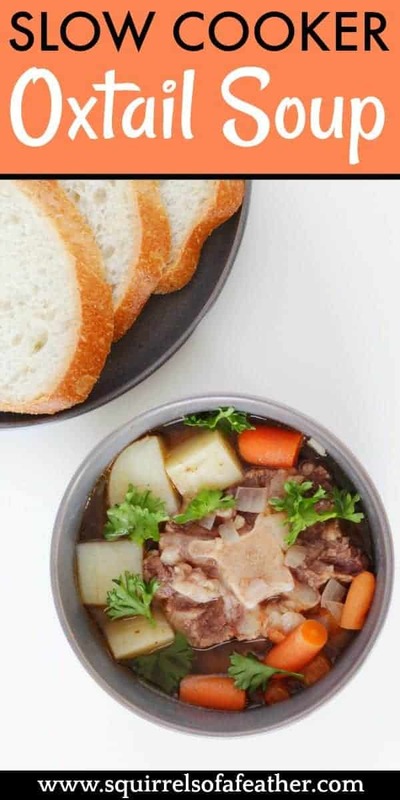 This oxtail soup recipe incorporates carrots, onions, daikon, and potatoes. If it isn’t easy for you to find daikon in your area, you can always leave it out and increase the number of carrots and potatoes. Some recipes will encourage browning the meat first, cooking the onions, deglazing the pan, etc. But I like to keep this recipe as simple as possible…and without sacrificing any flavor! Everything is just tossed into the slow cooker and left to take care of itself. I like to select oxtail that has more meat on the bones versus the smaller ones which are mostly cartilaginous. Try and select a pack that has a nice mix; if you can’t find one you like, you can always ask the nice gentleman behind the counter to cut you a fresh batch. The oxtail pictured below has two nice, big chunks that have plenty of meat and some medium sized pieces. First, rinse the oxtail to remove any cartilage shards/debris and pat dry. You want it to be nice and clean. 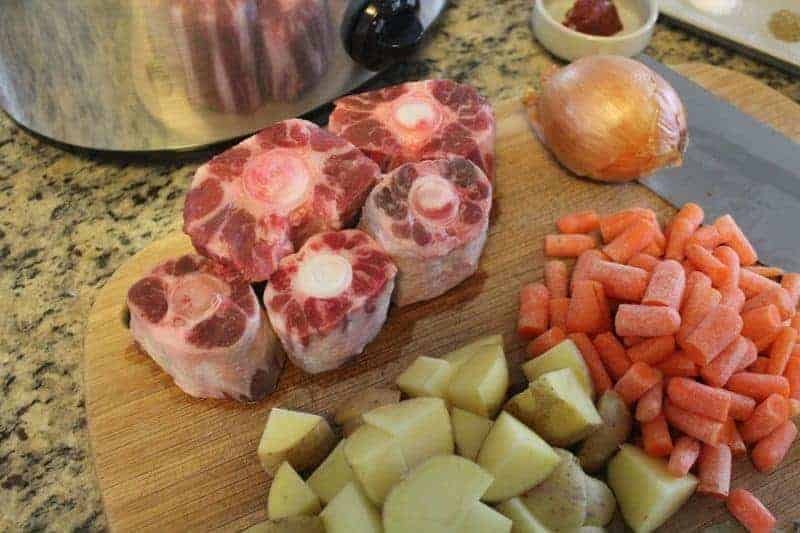 Next, place the oxtail, diced onions, minced garlic, tomato and water (about 4 cups or just to cover meat) in the slow cooker. Add the bay leaf, pepper, thyme, salt, Worcestershire sauce, and tomato paste. Stir gently to combine. Place the lid on the top of the slow cooker, lock it in place, and turn on the slow cooker with the setting on low. Cook at low for 4 hours. After 4 hours of cooking on low, open the slow cooker and add the cubed carrots, daikon, and potatoes. Quickly recover and cook on low for 2 more hours. (Adding the veggies and potatoes later helps prevent them from disintegrating into mush). After 2 more hours of cooking (6 total hours), increase temperature to high and cook the final 2 hours. After 8 hours of cooking, turn off the slow cooker and skim the fat from the surface with a large spoon. Allow to cool enough to handle. 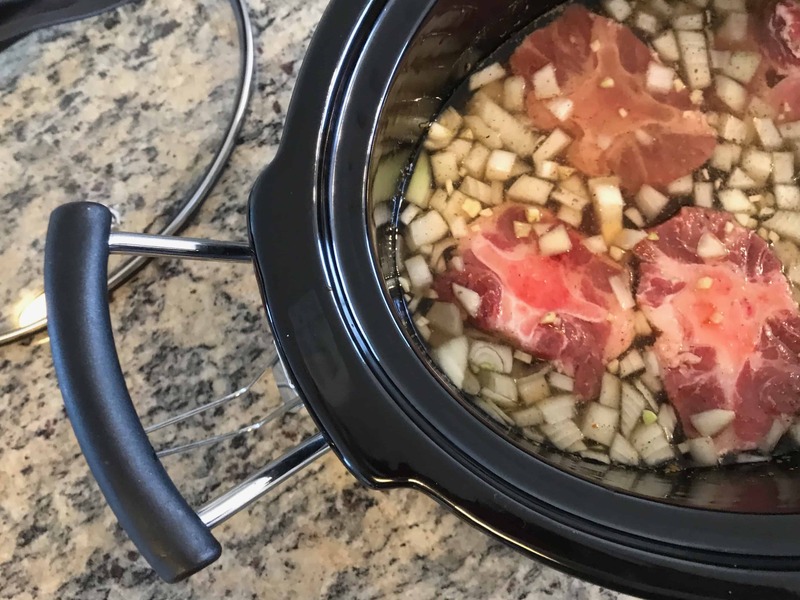 I hope you enjoy this slow cooker oxtail soup recipe! This oxtail soup is hearty, filling, and oh-so simple to make! The oxtail is rich and tender, the vegetables bright and yummy. Pair with rice or bread for the ultimate meal. Rinse the oxtail to remove any cartilage shards/debris and pat dry. Place the oxtail, diced onions, minced garlic, tomato and water (about 4 cups or just to cover meat) in the slow cooker. Add the bay leaf, pepper, thyme, salt, Worcestershire sauce, and tomato paste. Stir gently to combine. Cover and turn to low. Cook at low for 4 hours. After 4 hours of cooking on low, open the slow cooker and add the cubed carrots, daikon, and potatoes. Quickly recover and cook on low for 2 more hours. After 2 more hours of cooking (6 total hours), increase temperature to high and cook final 2 hours. *If you can't find oxtail at your local grocery store, most Asian grocery stores will carry it. I always ask them to cut it fresh for me to my size specifications; I like to get more of the meaty tail and less of the end where it is just cartilage. The flavor of this soup will be fantastic! So glad you could join us on Full Plate Thursday and thanks so much for sharing with us. Hope you have a great week and a very Happy Mothers Day! Thanks Miz Helen, have a great Mother’s Day yourself! 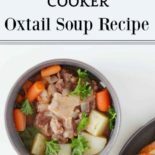 I haven’t tried your recipe yet, but wanted to say that I have heard of oxtail soup. It was very popular in my hometown, which had a high percentage of Eastern Europeans. My father was known to make the best in the town. (He often made it for the weekly summer community picnics and people would often ask if it was his before buying). His two methods that made it so good were to cook it all night on our outdoor fireplace and to have his daughters chop all the vegetables the same size (similar to your 1 inch cubes.) He even called it “Chinese style chopping,” saying it helped them cook more consistently. Of course, daikons were not available in our area in 50s and 60s; a more European style blend of root vegetables was used. Thank you for bringing back this memory. I don ‘t know how he would feel about using a slow cooker, but he was usually willing to try new things and I think the consistent heat would gain his approval. That sounds really amazing, BetteAnn! Your description was so good it almost took me there myself. Slow cookers are good for the very reasons you say; I plan on trying to cook it in my Instant Pot soon too! Those are a little bit more finicky than crockpots though.